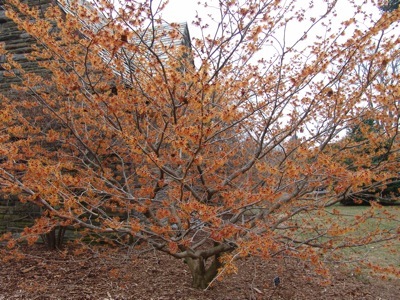 ‘Jelena’ is among the most impressive of the witchhazels we grow here at the Scott Arboretum. 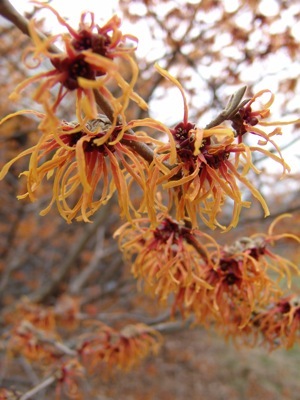 She’s a hybrid cultivar of the Chinese witchhazel (Hamamelis mollis) and the Japanese witchhazel (Hamamelis japonica), and like both of her parents, she flowers in the dead of winter when we’re desperate for a bit of garden interest. She is striking when in bloom —curled, strappy petals emerge from a burgundy calyx cup and are red at the base, orange in the middle, and yellowish at the very tip, giving the flowers the appearance of dancing flames. Incredibly, these blossoms remain effective for a month or even more! What’s more, ‘Jelena’ drops her spent leaves prior to blooming, unlike many other witchhazels whose ragged foliage obscures their floral display. ‘Jelena’ has a beautiful growth habit that further magnifies her garden-worthiness. It is an elegantly broad-spreading shrub with graceful branches that grows slowly to a maximum size of 20′ high and wide. I just bought a gorgeous specimen at our arboretum’s annual plant sale. Can’t wait to plant it near our barn, which we just painted matte black, she is going to be perfect right there underplanted with hellebores and ferns. Does this variety have much fragrance? I love the coy, subtle flavor of the H. mollis, but i’ve heard some cultivars have lost their nose in favor of a particular color. How does this one smell?